Today, we once again had some thunderstorms roll through the area. I am not a big fan of thunderstorms raging in the skies. I find myself lying real still and counting the seconds in between each crash of thunder. There are also storms of life. I am reminded that if we spend too much time chasing the storms that rage around us we will miss the sunshine. I am waiting for these storms to pass. Starting today or on Monday August 1st you will likely notice a lot of purple ribbons every where. 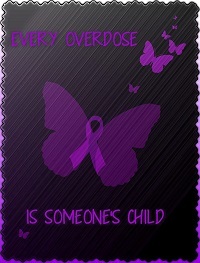 Many of us have pledged that we will light our Facebooks up purple with Overdose Prevention Awareness everyday. 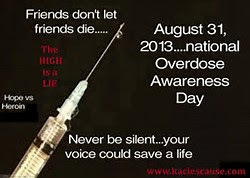 August 31st is National Overdose Prevention Awareness Day. I wish I didn't have to hear about another life gone because of heroin and addiction. Today is Day #47 of our Nar Anon Group Just For Today Challenge. I am also integrating the Live Happy into my Challenge. The Live Happy Challenge for today is to say I love you to the person you love. Leave love to it's own devices or take some action to evoke a response from your lover. Write a simple "I Love You" note and tuck it under your partners pillow to be found when it's time for bed or after you have left for the day. Such a simple act will call up strong, loving feelings in him during you absence. Expect a call, possibly the delivery of some flowers, or lots of attention. Want a double dose of happiness? Try it and see for yourself the results. I have taped a note on the steering wheel of our vehicle for the hubby to find in the morning when he's leaving for work. I have tucked little notes into his lunch bag. At times I've called him on his lunch break just to tell him I love him. Just For Today: Today I will focus on the things that I am grateful for in my marriage. A bill to legalize marijuana was introduced Wednesday as a possible solution to the state of West Virginia’s budget crisis. It was introduced by Del. Mike Pushkin, D-Kanawha. When I think of all the things I am grateful and thankful for it is often like looking into a kaleidoscope. So many things swirling around in my mind. So much beauty and yet still so much pain. 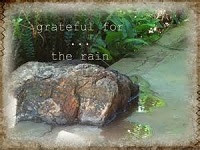 Today I am grateful for the rain that is falling. Rain falling on my flowers and my garden. Rain for the grass which is turning brown from the lack of thereof. Rain for the ground under our feet which is turning hard. The dark clouds in the sky to the south. The sun appearing in the sky to the north. I hope for a rainbow but still grateful for the rain. We need some rain not only to water our gardens and vegetables and flowers but also to fall and wash away the old but to bring about the new again. I am learning that with the sun some rain must also fall to wash away the sorrows and the pain. With the rain that is falling and the new day ahead I am thankful for this beautiful day. Today is Day #46 of our Nar Anon Group Just For Today Challenge. I am also integrating the Live Happy into my Challenge. The Live Happy Challenge for today is about taking time as a couple. Nothing thrives through neglect. That is especially true for romantic relationships. Lavish the kind of attention on your romantic partner that you desire yourself. Make a reservation at one of the best bed and breakfast establishments in your area. Such accommodations usually offer intimate, cozy settings and comfortable bedrooms (sometimes with fireplaces and Jacuzzi tubs). Breakfasts can range from a simple offering of freshly baked muffins with coffee and juice to an opulent gourmet feast. Surprise your lover with a weekend getaway and watch how love blossoms. We on this side know that loving an addict can take so much of our time and our attention and often away from our spouse. My hubby has stood strong beside of me and for our family. We were trying to plan to go away for our 35th Anniversary but this I know will be totally impossible. We have one of our grandchildren until probably September. Just For Today: Thinking I need Calgon to take me away!!! Today is Day #45 of our Nar Anon Group Just For Today Challenge. I am also integrating the Live Happy into my Challenge. The Live Happy Challenge for today is about taking a day out with your best friend. Let your best friend know how much you value the friendship. Invite them for a relaxing afternoon at the spa. Treat your friend to their favorite relaxation treatment or hot stone massage. Imagine how great they will feel when the massage therapist places sanitized warm stones of smooth volcanic rock or basalt on their tired back, shoulders, or neck muscles. If there's been any friction between you. a spa day can ease that as well. So go ahead and book an appointment. Invest the time and cost of the massage in your friendship. A happy relationship with your best friend is worth every penny. If you can't afford a spa day go get a mani-pedi!!!! Just For Today: I will relax!!! I am currently at a crossroads. At times it has felt like a spiritual warfare. I was raised and grew up in church. While still believing that yes I am a Christian because of a commitment I made years ago it feels as if a battle is raising up around me inside of me. There are many who will argue this debate. I know I live in a family of them. You may or may not wish to believe that large pharmacutical companies paid doctors and others for pushing OxyContin and other pain killers. Three thousand eight hundred and fifty three doctors in West Virginia were paid to play. It's a well known fact today that doctors who receive something in return are more likely to prescribe more of a certain drug This is something that has been going on for many years. One of the biggest problems right now in Berkeley County and Martinsburg West Virginia is that we have no treatment center right here. Today is Day #44 of our Nar Anon Group Just For Today Challenge. I am also integrating the Live Happy into my Challenge. 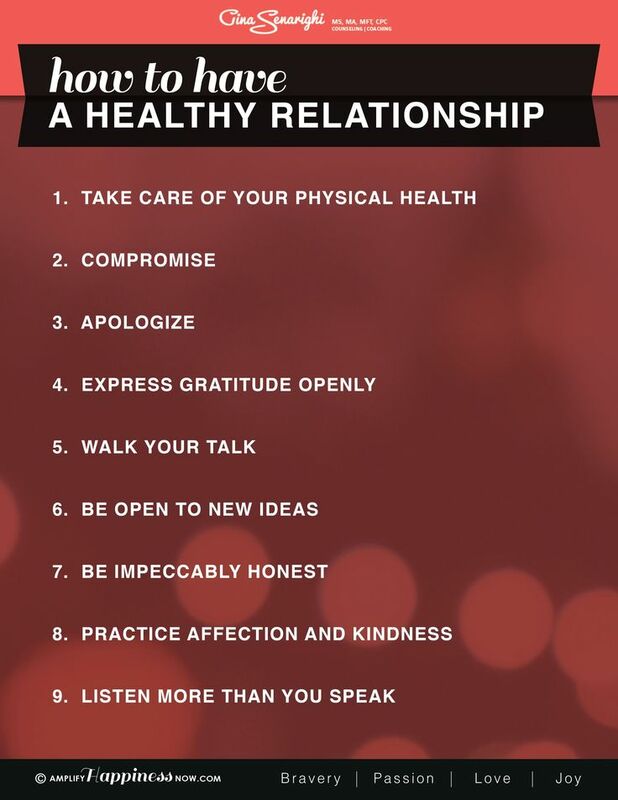 The Live Happy Challenge for today is about relationship matters. 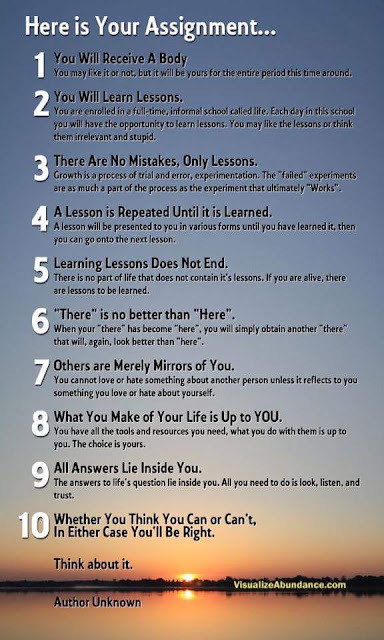 This section of the Live Happy pertains to Building Happy Relationships. The families going through heroin and addiction with their loved ones we know many whose marriages bear the battle scars and the wounds of loving an addict. When you feel so emotional that you can't think straight, it may be time to seek help. Explain to your partner that you believe the two of you could work through the tough issues if only you could talk about them without pushing each other's buttons. One way to not do that would be to find an impartial third party, perhaps a relationship expert or a marriage and family counselor, to guide you through the emotional minefields. Relationship experts can reveal ways to shift the relationship paradigm so you don't stay in a "stuck" place. Working through the issues can strengthen a relationship and make the individuals feel more hopeful, optimistic, and happier. Just For Today: I am thankful that my marriage has remained strong. I just heard on a news report that in this country overdose deaths are exceeding the number of car crash fatalities. When I heard that report given first it was of no surprise really. I thought, WOW that is just the craziest because accidental overdose death are preventable. When I say addiction has pummeled my family and left the battle scars to prove it, I do not exaggerate. I often set and wonder about the generation of my kids. These are commonly referred to as, the Gen Y kids. Today is Day #43 of our Nar Anon Group Just For Today Challenge. I am also integrating the Live Happy into my Challenge. The Live Happy Challenge for today is about just saying 'hello'. Pay attention to the people around you. Instead of standing next to the stranger for the elevator ride up several floors, look them in the eye and offer a greeting. Hello is easy to say. It's only one word. It might lead into a conversation about the weather, the latest news about your city or town, or something about the environment (the noise next door due to construction, for example). You'll never know where the elevator chit-chat might lead if you don't open your mouth in the first place. And who knows! That stranger could become a new friend or a romantic interest. If you have read other posts for this section you will know that I am married and not seeking any other interests. I have stated a couple of times in this section on Happy Relationships that we never know what another person is going through. That person in front of you at the grocery store or behind you in the grocery store could also be affected by this heroin epidemic here. Some are stuck in the stigma that society has placed on the families of those suffering from addiction and I know how lonely of a place that can be. We lived there for eleven years- afraid to talk about it openly. BTW November 21st is, World Hello Day!!! Is it against the law to suffer with the disease of addiction? Apparently in the United States it is. We as a country have allowed our lawmakers to criminalize those who suffer with addiction so that now they are discriminated when seeking employment. Currently here, West Virginia has no laws regarding the employer use of criminal background checks. This trickle down affect has even led to discrimination in housing. Now, a criminal record will likely prevent someone from being able to find an apartment or house even though a person has recovered from their drug addiction. How in the hell can we as a society expect someone who has recovered, to remain in sobriety with so much discrimination? The stigma will continue as long as we allow it. If we want to solve our nation’s drug problems, we need to focus less on obtaining convictions and more on preventing addictions. We should be treating people with addictions, not handcuffing them. Today is Day #42 of our Nar Anon Group Just For Today Challenge. I am also integrating the Live Happy into my Challenge. The Live Happy Challenge for today is about flirting with someone you are interested in, if you are single. Starting today it is likely that you will see a lot of Facebook Pages lit up Purple for this month. August 31st is International Overdose Prevention Awareness Day. In my opinion, everyday should be overdose prevention awareness day. I gave a lot of my ribbons away on July 23rd at our meetup. One lady asked for twenty to give to those she knew so they too can rock the purple ribbon. Just the fact that people are still overdosing on heroin here in my town and people are still dying here in my town indicates we still have a lot of work to do here in Berkeley County and Martinsburg, WV. The stigma of this disease is still alive and kicking here in this county and city. I have talked to so many people here. There are those who have lost a loved one. There are those going through this with someone they love. Then there are those who haven't even gotten here yet. Today is Day #41 of our Nar Anon Group Just For Today Challenge. I am also integrating the Live Happy into my Challenge. The Live Happy Challenge for today is about starting a conversation with a total stranger. Now, this doesn't necessarily mean that we are looking for love, or flirting either. Have you ever asked a stranger for the time? Personally this is what our son Kyle is dealing with- Dual Diagnosis. He was treated for depression several years ago. On July 10th we found him in really bad shape once again. He was talking about suicide once more. Mental illness is common amongst a population suffering from substance abuse and addiction. The relationship is so strong that many people believe the drugs play a causative role in the development of the mental illness. In most instances, this is not the case. In the United States, approximately 8.9 million people have both a mental health and a substance abuse issue. Every day, 78 Americans die from opioid overdoses. I have heard from too many families across the country whose lives have been shattered by this epidemic, including a mom from Ohio who recently wrote: "There are not near enough facilities in this area to handle the amount of care that is needed... We need help." My Administration has been doing everything we can to increase access to treatment, and I'm going to continue fighting to secure the funding families desperately need. In recent days, the law enforcement community, advocates, physicians, and elected officials from both sides of the aisle have also joined in this call. Now, it's up to Republicans to finish the job and provide adequate funding to deal with this public health crisis. 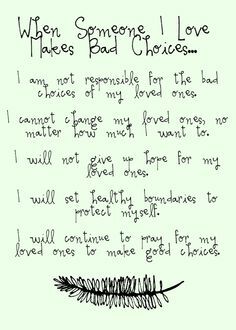 And also for my family to heal. There is a new Facebook Group, Inmate 101. This page is for an anonymous inmate to share the story of addiction in hopes to lead others to a path of recovery. Our son Kyle did really good maintaining his sobriety for several years. Because we didn't know what truly happened we started interjecting our own feelings into it and concluded that it had to be his old friends. About three years ago he relapsed. For a year we have been racking our minds trying to figure out, what happened? 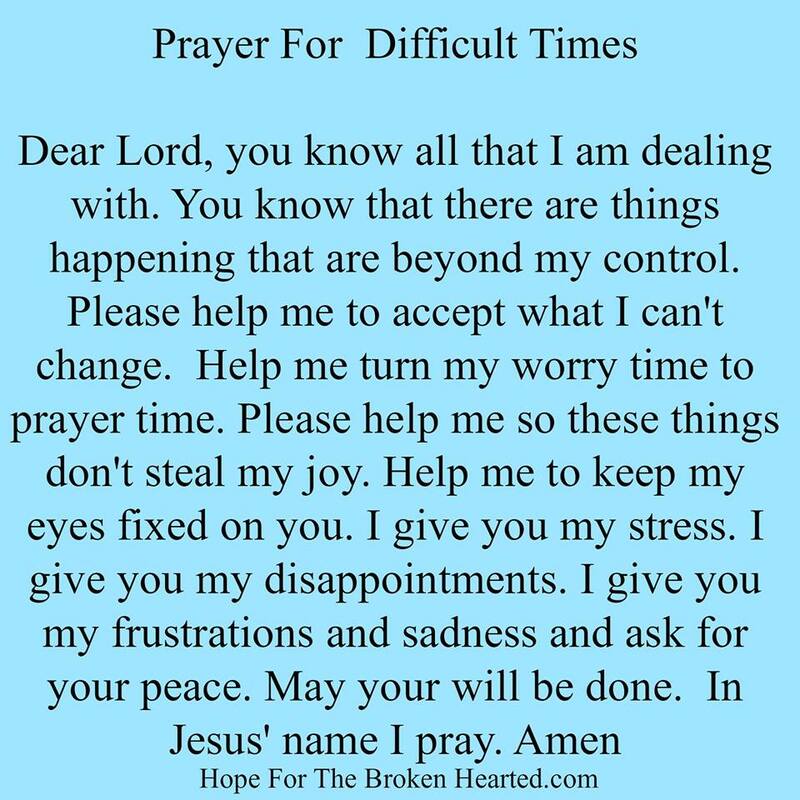 After some recent events with our son and in talking to someone close to him we have learned a few things that in doubt led to this spiraling out of control so fast-so easy. About three years ago Kyle was working a stable job. He tells me about others on his job that were using pills around him and that he had been so strong in declining any offers. He hurt his back one day on the job. A guy on the job offered him a Perc. At first he declined it, but as the day went on his back was hurting even more and he took the pill. He said he knew just swallowing it would not have that immediate affect he needed, so he smoked it. Kyle said there was immediate battle going on his head. He felt so guilty for doing it, but it relieved the back pain. He said this one time use set off a trigger in his brain. He told no one- not the girlfriend- not us- no one. For approximately six months he became what is known as a functioning addict. Then came the layoff. Not enough work to go around and he and his crew were laid off. This would be the event that set in motion the decline and his sobriety spiraling out of control. He was looking for work, but as we all know having a criminal record doesn't make it easy finding a job. With his back still hurting he found it easy to keep himself self medicated on the streets. He could find what he needed anywhere. He started lying that he was out looking for work. He said he was embarrassed to tell his then girl friend that he couldn't find anything because of his record. He became too overwhelmed with the pressure that he needed to find a job to help with the household expenses. He had denied to himself and those around him that he had a problem. That would mean admitting he had slipped. When he finally admitted what he had been doing-self medicating- it was pretty much too late. He had been using heroin for many months at that time. His then girl friend would take him to the hospital because at times the pain became so bad he went into seizures. One look at track marks and it is like "GAME OVER" at the hospital. They did not believe he was in pain and he often was told take Tylenol and sleep it off. He never in the past years stopped complaining about lower back and abdomen pain. Sometimes the pain was so severe he couldn't walk. Other times the pain so severe he went into seizures. Last year when he was going to the Martinsburg Institute we know that his medical records were faxed there and was told that he had some really severe medical problems going on. One being his kidneys. Living the life of loving someone addicted to drugs it is often hard to be grateful for anything much less finding something to be thankful for in the moment especially when you are angry. 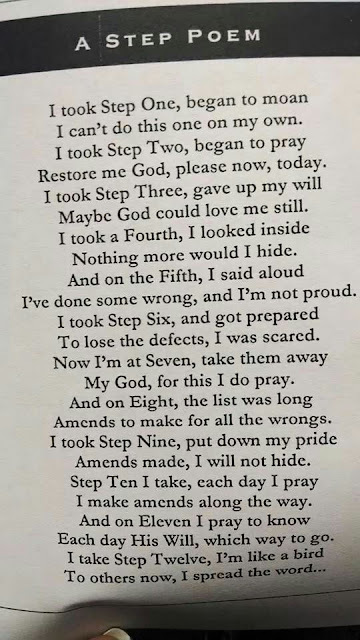 I am trying very hard and in fact learned a few things just yesterday that pretty much has put the puzzle of our sons relapse in an order that makes sense. There are many factors which caused this to occur. He didn't purposely relapse. No addict sets out to purposely live a life of drugs and abuse of drugs. Until those close to me has a better understanding of this drug in particular and recognizes that this is a disease I have had to distance myself. It's much easier that way. I'm tired of explaining it. I'm tired of hoping they will understand it. I am pretty much at the, LEAVE ME ALONE phase. In Nar-Anon I hear Tina constantly say, Just Breathe. I close my eyes often and just breathe. Without the air to breathe I couldn't survive. So right now I am grateful for the air I breathe. Go ahead Warrior Mamas and Papas, put this on repeat. Remember we often pray for what we need, but do we ever really just say thanks for the smallest bit of gratefulness such as the air that we breathe. I am learning new things each and everyday. I just recently learned what exactly caused our son to relapse three years ago. Mostly what I am hearing from the girl friend and the information I am learning, in the end this possibly can turn into a mess. I'm not here right now in this post to talk about such things. This post concerns effective treatment for drug addiction. Today is Day #40 of our Nar Anon Group Just For Today Challenge. I am also integrating the Live Happy into my Challenge. The Live Happy Challenge for today is about dating. This exercise/challenge is for the single folks out there. If you feel lonely, do something about it. Visit a few online daiting sites; read about their audiences demographics and the criteria for joining. Decide on two or three sites that might be a good fit for the type of potential friend or romatic partner you desire. Join one. While dating is still about meeting new people, contemporary dating sites make it easier than ever. You can tell the world exactly what you want: for example, an emotionally healthy individual, a baby boomer who loves classic rock n roll, or someone who love to pair great cooking with fine wine. So banish those lonesome blues, start tapping those keys to connect with others, and make way for some great camaraderie. With the world at your fingertips, what are you waiting for? JUST FOR TODAY: Spending quality time with the hubby. On July 10, 2016 we set out from Martinsburg to Huntington, WV with our son to a recovery house. Five and a half hours to get there. A ten hour round trip. We were happy he made the choice to go yet scared of all of the unknown and what if's. I have thought about when that day would come thousands of times. I imagined a celebration inside that I could express this joy to the world. Instead it was the total opposite. It was just too soon. We were so afraid to talk too much about it or celebrate any milestones because of fear we would jinx it yet we did it anyway. 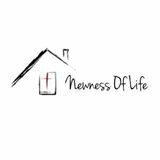 Last Sunday at NarAnon we celebrated what seemed like a new beginning for our son- truly a newness of life was shaping up. Or so it seemed. This week we do not know what happened. We know the first weeks and first months are full of the ups and downs- mentally while someone is in treatment and recovery. He was having some problems there from the beginning. The demons of addiction he speaks about inside his head are real to him. We didn't expect anyone to babysit him there. We only wanted him to get better. We surrounded him with positivity. His second day there he experienced some problems that he called the demons in his head. We thought he had worked through those. He seemed so much better as the week went on. Sunday July 17th He went to church. He was baptized. We back here were so excited. It seemed he was making real progress. When we talked to him that evening he seemed really excited that he'd be going the next day to look for a job. I didn't say to him but I fretted about this. Was it too early? That evening I talked to him and could tell from his voice. I asked him what was wrong and he said he lost everything that even mattered to him. He had been talking to his ex girlfriend and although it was too early to even talk about anything dealing with the relationship I guess things were said. We don't know. That too is a he said/she said. We tried our best talking to him in positive conversation. Reminding him he is there to heal and should focus on himself. I don't know I had a bad feeling after getting off the phone that evening. In the early hours of July 19th we do not know what happened there. He once again left the house and we have no clue what happened. He says one thing; the recovery house another so we don't know. He wanted to go for help. He is down there. He knows the process. The rest is up to him. Today we got together for a Solidarity Meeting at 109 E. Martin St. in Martinsburg, WV. Mr. James Boyd led the meeting in which only a few attended. The purpose and the hope of this gathering was to bring the groups together with all of the resources for treatment and recovery as well as an organizing of those resources and educating those outside of the groups who attended. I have a page at the top of the blog specific for listings of treatment and recovery services here in West Virginia. I have been trying to keep this page updated. Although I have this directory posted on that page, I wanted to put it here in a post as well. The SAMHSA (Substance Abuse and Mental Health Services Administration) National Directory of Treatment facilities in the U.S.A. If interested, this is in PDF form but does not require download. Give it time to load because it is over 800 pages. One problem we have here locally and throughout this state is that for so many years those who are addicted to drugs have been criminalized for having a substance abuse problem. Once a person gets clean and they are trying to put their lives back together there is a problem obtaining a gainful job that will support them and often their family. Many places do not or will not hire a felon. Some states limit employer criminal records. Here in West Virginia we do not have a law that limits employer use of criminal records. Now there are federal laws that protect from employment discrimination many times this doesn't apply to those who have a record. Some states require employers to consider whether the offense bears a reasonable relationship to the job. Some states have passed laws restricting how employers may use an applicant’s criminal record in making job decisions. And, some states prohibit employers from asking about arrest records. The next section of Challenges is about building Attracting and Building Happy Relationships. With our son five hours away in Huntington, WV right now I am trying to arm myself with information. In just the first week we experienced the slippery slopes. The ups and downs after detox. This is a scary time for those of us who love an addict. I've tried identifying triggers as a way to help in positive ways. 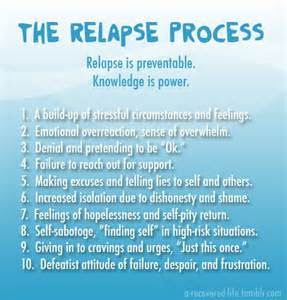 This is the relapse process. We all know that relapse happens. While I don't understand it fully I have been assured that relapse is normal in the recovery process. This says that relapse is preventable and that knowledge is power. If you have a loved one recovering pay attention to these signs in your loved one. The next section of the LIVE HAPPY Challenge is about Attracting and Building Happy Relationships. I cheated and peeked at them. Hey I was curious! Some are for married couples while others are for singles only! Then the rest are a mix of both. I hope the next section of the LIVE HAPPY CHALLENGE has something for all of us- married or single. Today is Day #38 of our Nar Anon Group Just For Today Challenge. I am also integrating the Live Happy into my Challenge. The Live Happy Challenge for today says that we should give a helping hand when it is needed. Join others who want to make their lives count for the greater good. One way to find meaning in your life is by devoting time, money, and expertise to the fight for others who have been unjustly imprisoned. Their voices have been silenced. Amnesty International works hard to expose such human rights abuses. The organization and it's supporters have helped save the lives of thousands of victims from torture and execution at the hands of rogue warlords, armed guerillas and oppressive regimes and governments. Your help is needed and wanted. Contact Amnesty International to find out how you can help. Leonard's case is just one of the cases on Amnesty International. Volunteering is a great way to make a difference. Here locally in Martinsburg we have the Berkeley County Senior Center, the humane society is always seeking volunteers to help out. Whatever your passion you are likely to find a group for that cause. Today is Day #37 of our Nar Anon Group Just For Today Challenge. I am also integrating the Live Happy into my Challenge. The Live Happy Challenge for today says that we should join a club. One way to make your life more meaningful is to join others in working to save the planet. Sometimes things can be accomplished only when working in concert with other like-minded individuals in groups like the Sierra Club or the Rainforest Action Network. Joining a group of people who share your feelings about a common cause can inspire you to do things you might never do on your own. 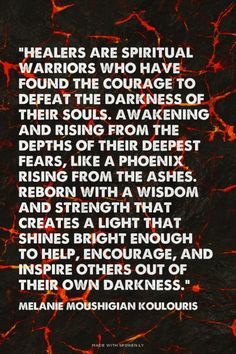 Plus, there is truth that there's strength in numbers. Although one person working alone may not be able to save a rainforest, thousands or millions of people rallying around a single goal might just accomplish it. Now, while I am concerned about the planet Earth, I am more concerned about the heroin epidemic here in our community. I know that things are being accomplished because of the groups coming together to work side by side. Just since April I myself have had the courage to come forward out of the stigma of feeling alone. I have met so many wonderful people a long the way. I notice the Berkeley County Heroin Epidemic Awareness Facebook Group is growing in numbers. The Bikers Against Heroin is growing. Take for instance The Hope Dealers Group, Mom's Against Heroin Groups and Someone's Child. It's okay to branch out, but we need to remember that everyone needs to work together because we only have one goal to accomplish here- to bring more awareness to our community. We have so much work to do. Just For Today: I will do my part. Have you ever heard the Legend of the Phoenix? How this bird continues to live forever? It flies too close to the sun, it is burned and it rises up through the ashes? I know most people do not want to be involved in any matters like that and likely for many reasons. For one, fear of retribution. Don't turn a blind eye or deaf ear to criminal activity or injustice. Stand up for what is right. If you witness an accident a robbery, abuse of a child (even if it appears the abuser is the parent), dial 9-1-1. Fear of reprisal or worry that getting involved may eat up too much of your time or cause you stress seems trivial when you consider that the crime could happen to a member of your own family. If so, you would want other's to help, especially if they witnessed what had transpired. Aid someone in distress. Heling another person can be gratifying, and even make you happy whereas doing nothing can cause feelings of guilt and remorse. If you saw someone in need of help would you? If you saw someone overdosed on heroin would you call for help? Would you render help? Have you ever witnessed a crime? Did you call the police or 9-1-1 for help? We live in uncertain times don't we? Just For Today: I will let go of the fear of the unknown. Walking away from yesterday is often the bravest thing you can do. 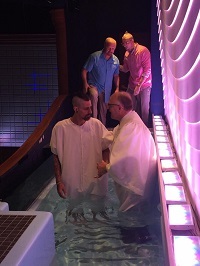 Sunday was the day our son stood on the solid foundation in which he would start to rebuild his life once more. Recovery from this disease is much like that. Go ahead!!! Celebrate this milestone in Recovery!!! Celebrate the Transformation. You are a new person!!!! "You gain strength, courage and confidence by every experience in which you really stop to look fear in the face. You are able to say to yourself, I have lived through this horror. I can face the next thing that comes along. You must do the thing you think you cannot do." West Virginia is a beautiful state isn't it? Hello...Someone forgot to unlock the doors!!! We have but one life what will we do with it? Today is Day #35 of our Nar Anon Group Just For Today Challenge. I am also integrating the Live Happy Challenge into my Just for Today and daily routine. 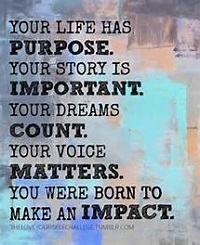 The Live Happy Challenge for today is about finding purpose in your life and to write a mission statement of your life. It is so funny how this challenge goes a little a long with Step #4 of NarAnon and how we are to search ourselves and make a fearless moral inventory of our lives. On Sunday July 10th I had just posted the first installment of my PROJECT: Gone, But Never Forget Them. 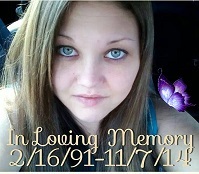 It was Kathy's story about her daughter, Tiffany who lost her battle with heroin and addiction in 2014. I was PMing with Kathy Stevens Butts thanking her for her story of her beautiful daughter Tiffany and telling her no new changes for our son Kyle. I was telling her how I was losing Hope that we would ever be able to save our son. I had already gotten there. A couple of weeks ago I noticed that my blog had taken a jump in the stats- the number of those visiting and reading here. I decided to investigate is a little further on the keywords being searched. Using the keywords I can see what people are interested in reading or info they are seeking so I can find that info and put links here or write a few stories about what they people are searching for. Justin has a great program going on down in the sourthern part of the state. This is a treatment and recovery house. This is a long term program. Eight to ten months to graduate; more time if needed. At first you may not feel like this is for you, but you'll be glad you went. I was talking to my son today and he started talking about the Butterfly Garden a place he visited several years ago. He wants to get well enough to visit again- and he should. Last Sunday turned into a remarkable day. Our son can only take it day by day. That is all we can look at ourselves. This is a day by day process. A step back for a moment. Take a deep breath and breathe. I don't know how Justin from the Newness of Life knew how bad off our son Kyle really was but he did. I cannot explain it other than an angel stepped in to intervene that day. I don't want to even exaggerate. I absolutely don't know how much time Kyle did have on Sunday. He was in pretty bad shape when we got to him. He had just used right before we got there and was pretty messed up and had been mixing some really crazy things- coke and heroin for one- for days. He told us about several OD's the past weeks only to be recovered. He had been searching for something with fentanyl since Friday the 8th. Some see things as fate intervening. I see it as apparently he has a purpose on this earth. Today is Day #34 of our Nar Anon Group Just For Today Challenge. I am also integrating the Live Happy into my Challenge. The Live Happy Challenge for today is to start a new family tradition. 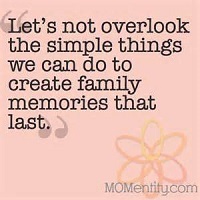 Brainstorm with your children and spouse about making a new family tradition. Perhaps something wonderful and spontaneous occurred as you were preparing to leave for summer vacation, the night before Thanksgiving, the afternoon of the first snowfall of the season, or on the way to the pumpkin patch. 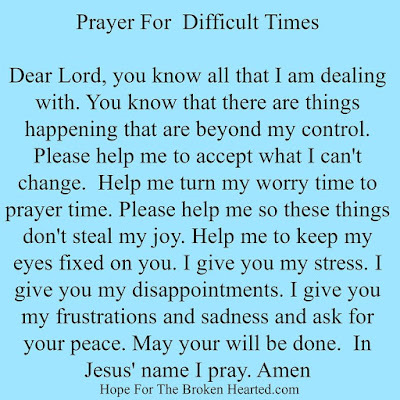 Giving It All Up To A Higher Power Let It Go and Let God! Pick ripe fruit off your backyard trees and box it up for a local food bank to give to the poor. Giving your surplus fruit and produce to a local food bank will help feed people without resources or options to purchase everything they need. You'll be glad to know you did something nice for someone else and that the excess fruit and vegetables won't be wasted. Even if you live in a city and don't have fruit trees, you could share vegetables and herbs from it with the poor. Today is Day #32 of our Nar Anon Group Just For Today Challenge. I am also integrating the Live Happy into my Challenge. The Live Happy Challenge for today is about giving the ultimate gift, the gift of life. You can sign up with the organ registry of your state and by letting the Department of Motor Vehicles know your wishes the next time you renew your license. Registering to be an organ donor is easy and can make a huge difference for an individual fighting for life as well as that person's family. Even though organ donation has long been a taboo topic for cultural and religious reasons, most of the world's great religious traditions accept it. Live happier knowing that at your life's end, the organs you no longer need can give someone else a fighting chance to live. If you want to give the gift of life visit, Donate Life WV or you can choose to do so when renewing your drivers license at the DMV. Just For Today: I appreciate the life I've been given. Today is Day #31 of our Nar Anon Group Just For Today Challenge. I am also integrating the Live Happy into my Challenge. The Live Happy Challenge for today is to help your favorite giving from your heart to charity. Want to live a more virtuous life, but you're not the type to do spontaneous acts of kindness or generosity? I am one for To Do Lists and BTW today I've already started my list for the things I need to do tomorrow- not because of procrastinating but because somehow those things seem to be categorized into the, " Tomorrow Matters"
I just realized as I'm going through the list this morning it hit me, I think I am being taught a lesson and that is the lesson of living one day at a time. So, I wanted to write an update on our son Kyle who is already two days into his new life. He chose to go to a recovery house on Sunday, July 10, 2016. To me, he has two days now to celebrate in a year. The day he was born and they day he chose to live. When we found him he had been doing heroin, pills and coke. He was in pretty bad shape. I had just messaged someone telling them that I had all but given up hope that I would ever be able to save him and the next minute that was exactly what I was doing. I sent my message and the phone rang telling me if I didn't get there to him my son was going to die. Amazingly he was right there where he told that person he would be. The first step was that he was there. We talked a little about life and about living and he chose to live and fight this demon. There isn't much to report as this is only his second day. I talked to him on the phone and he was starting to feel it but he's in good hands. He is at the Newness of Life in Hungtington, West Virginia which will be his home for some months to come. He is five and a half hours away- ten hours round trip. I am a little torn that he is so far away from us, but for once in six months I know where he is and that he's going to get the help he needed for his second chance at living. Today is Day #30 of our Nar Anon Group Just For Today Challenge. I am also integrating the Live Happy Challenge into my Just for Today and daily routine. 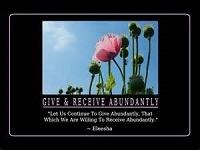 The Live Happy Challenge for today is about Giving. The ultimate gift we can ever give is that of life. The greatest gift you can give anyone is the gift of life. Hospitals nationwide provide life saving blood transfusions every day. Yet, all too often, a shortage of blood prompts blood donation centers, the American Red Cross, and hospitals to call upon citizens to donate and help replenish the nation's blood supply. Today is Day #29 of our Nar Anon Group Just For Today Challenge. I am also integrating the Live Happy into my Challenge. The Live Happy Challenge for today is to learn to save a life. Imagine the happiness you would feel it you were personally able to save someone's life. Prepare by learning how to do some simple first-aid, cardio pulmonary resuscitation (CPR), and the Heimlich Maneuver. Classes are often offered through the American Heart Association, the parks and recreation departments of many cities, and also through hospitals and clinics in community outreach programs. OR even The Red Cross offers many such as first aid. Find a class near you and take it. Then if you witness someone who has a medical emergency, call 9-1-1. But also don't hesitate to apply what you have learned. Doing something is better than doing nothing. You may even save someone's life through quick action. Now, there's something to be happy about! Many, many years ago I was a Girl Scout. I took a First Aid Class to earn a badge. I worked a job years ago and had to learn CPR and maintain my card. Although I've never had to use it, I do know how to do the Heimlich if I would ever need to. In all my life I never thought I'd ever have to take a Narcan/Naloxone Class because the life I may have to save one day would be someone I gave birth to. Remember, the life you save may be someone that you love! 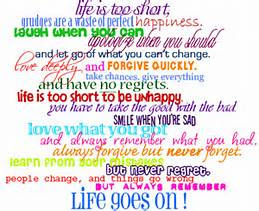 Just For Today: Today I will appreciate life. My world turned upside down in 2011, when my 20 yr old daughter admitted to being addicted to heroin. She was in college and had planned to work in the medical field. For fear that her dream and goal in life would be shattered, she asked me to help her, but not to tell anyone. She explained to me that she had experimented with heroin in 2010, but was able to stop on her own. Not everyone is that lucky. She became pregnant with my granddaughter, and tried to do everything just right. She ate healthy, went to all her doctor appointments, and so on. She had a hard delivery and we had quite a scare with the baby. Challenge Myself: Day #28 What Is Really Important To Me? Today is Day #28 of our Nar Anon Group Just For Today Challenge. I am also integrating the Live Happy Challenge into my Just for Today and daily routine. The Live Happy Challenge for today is to make a list of what is important to me. Millions of people live their lives without a sense of direction. Unless you know what is really important to you and what you want out of life, how are you going to know where you are going, how to get where you want, and what your life purpose it? Think of ten things that are really important to you, for example, family unity. Then makes each item as specific as possible. Instead of family unity, maybe you really mean eating meals together, working on the chores together, or praying together. Refine the ten things on your list until you know exactly what is of primary importance to you. These are the things that will make you the happiest. Knowing what they are can help you make better choices in your personal life journey. 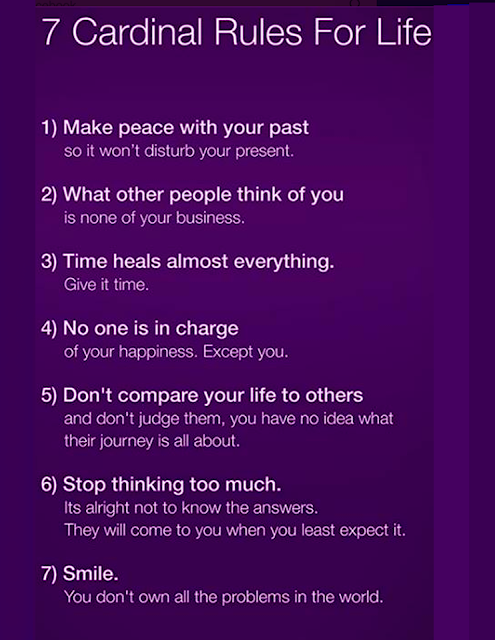 This is a powerful exercise, for one I really haven't thought about it until I started listing some and then it became apparent that I need to work on me and my priorities. Today is Day #27 of our Nar Anon Group Just For Today Challenge. I am also integrating the Live Happy into my Challenge. 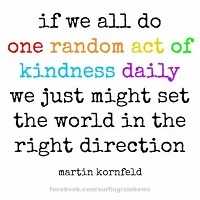 The Live Happy Challenge for today is about random acts of kindness. Life is so busy that sometimes a random act of kindness happens and we aren't even aware of it. Push the buttons in an elevator for a fellow rider. Help an elderly person up the steps to a building, a subway exit, or onto a bus. Pick up an item that someone drops on the ground. Put your pocket change into a charity box. Invite a fellow shopper to move ahead of you in the check out line. Shovel the snow off your neighbors walk. Offer to let someone share your umbrella. Random acts of kindness require very little effort but pay great dividends in the good karma and personal happiness they generate. If only just for today, be kind to someone. Kindness can come in many forms. Something simple as smiling at someone is an act of kindness. Hold the door open for someone. Say thank you to someone who held the door for you. Soon you'll notice one leads to another and then another and sooner or later you won't realize that it comes natural and you aren't aware that you are being kind to another. Another way is to pay if forward with a small kind gesture. That homeless man or woman you see on the street is probably thirsty in this sweltering heat. Buy him or her a bottle of water. Many right now are doing acts of kindness in helping those who lost everything in the flood areas here in West Virginia. 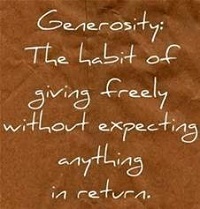 Just For Today: If I do nothing else today I will repay with kindness. Just Who Are The Laws Meant For? If you're from around these parts- The Eastern Panhandle of WV- I'm sure you know of the local cases involving some of our deputies in the Sheriffs Department. For instance, remember the drugs stolen from the evidence room by a deputy? He received a $5 fine. is one for Nancy Drew and amateur Sleuths. MARTINSBURG, W.Va. — A former Berkeley County Sheriff's Department deputy was sentenced Thursday to 10 days in jail on an embezzlement conviction stemming from the sale of guns that were in the custody of the law-enforcement agency. Dennis E. Streets, a former captain with the department, was taken into custody in Berkeley County Circuit Court after being ordered to begin serving the jail sentence immediately as a condition of the five years of probation that was imposed. "I think it's very important that you do some jail time," 23rd Judicial Circuit Judge John C. Yoder told Streets before he was escorted from the courtroom by court security.